Logitech has covered the power button and the two volume buttons in rubber, which makes them harder to use. With the iPad Pro, there's no Home button so it's sometimes hard to tell whether it's facing up or down, and it's harder to find the power button/volume buttons by feel and it's also more difficult to press them. It's by no means a deal breaker, but a little annoying. The case that the iPad Pro fits into is rather thin, but with the added weight of the keyboard, there's a lot of bulk to deal with. 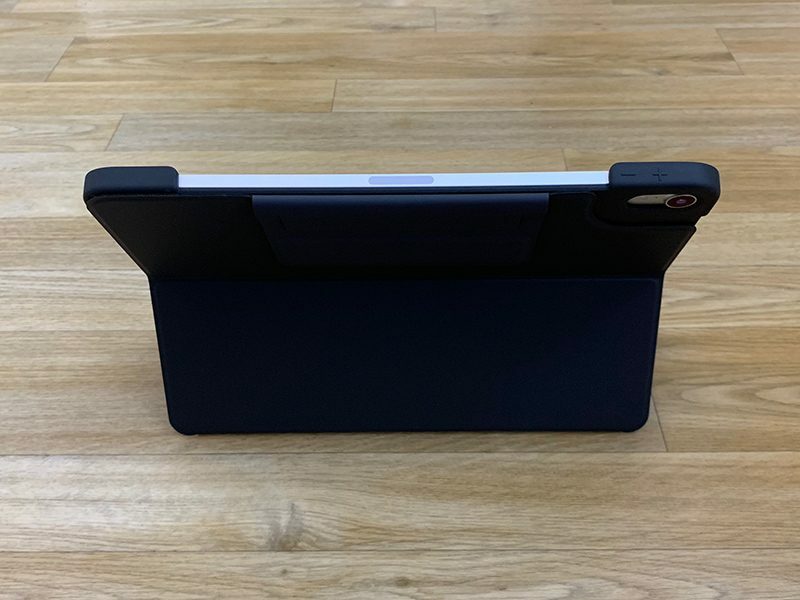 The case portion of the folio that holds the iPad is attached to the keyboard with a second layer of material that also serves as a stand, with the iPad held magnetically in place for comfortable typing. There's just a lot of case here. 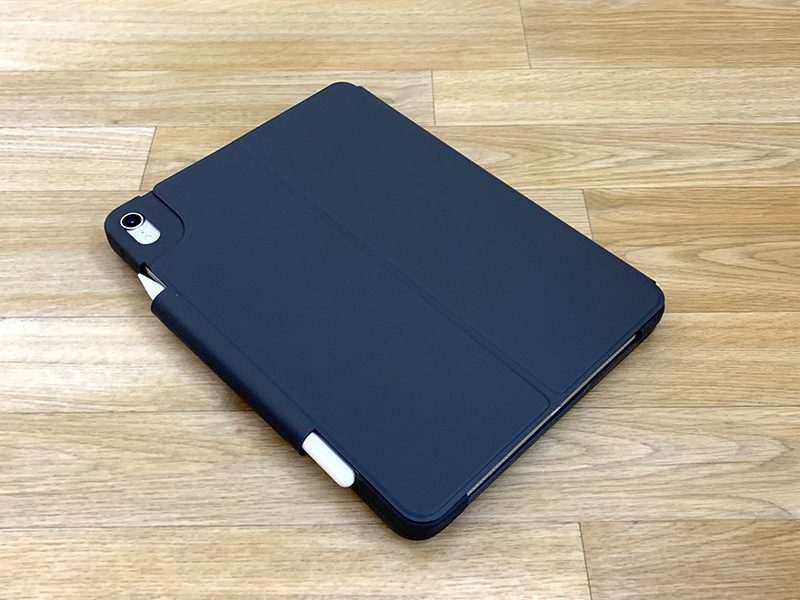 With the iPad Pro in an upright position for typing I don't mind the extra bulk of the case because it's appropriately distributed, but since this is a folio, you're meant to keep it on the iPad at all times. 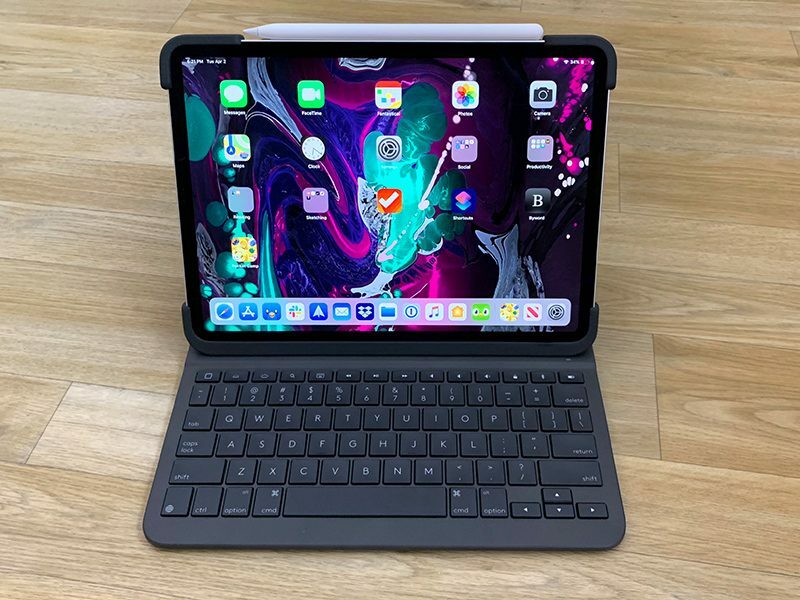 So when not typing on the keyboard, you're supposed to fold it back either under the iPad to use it as a stand for something like drawing with the Apple Pencil, or up and behind the iPad for reading, browsing the web, playing games, etc. 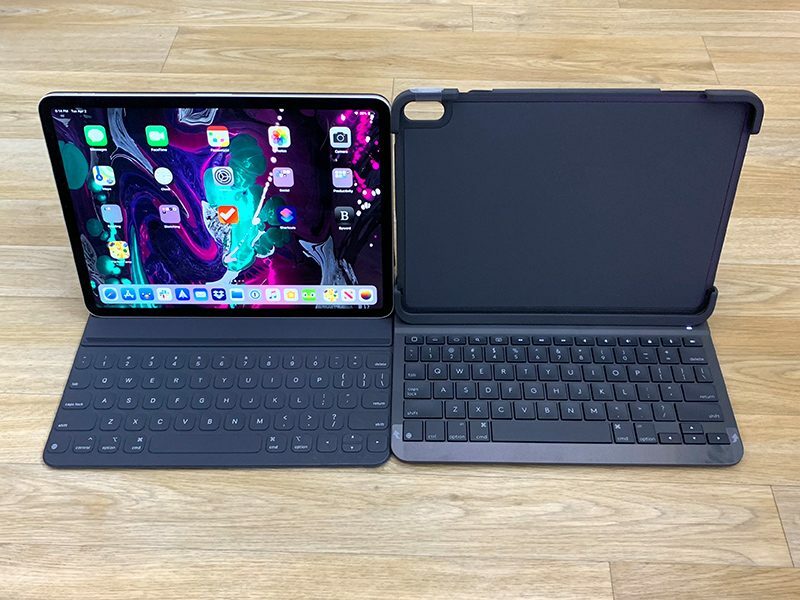 In either of these orientations, the keyboard is in an uncomfortable position that adds a lot of weight to the back of the iPad, though having an angled surface for drawing with Apple Pencil can be convenient at times. I do a lot of non-typing things with my iPad Pro like playing games and browsing the web, and I don't like the extra weight. Getting the folio on the iPad is a little bit of a struggle, so this isn't a situation where I'd want to have to put the folio case on to type and then take it off to play a game, though that's an option. 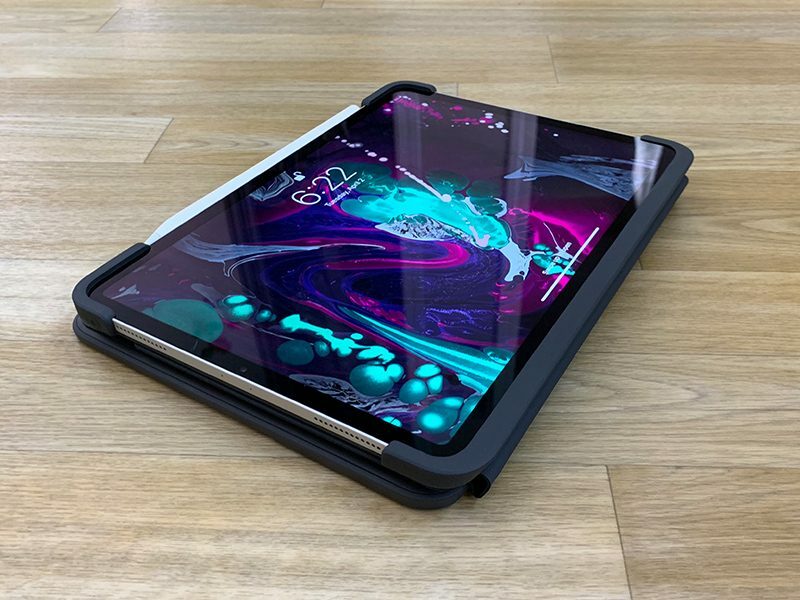 If you're using your iPad Pro for typing and sketching with Apple Pencil, you probably won't mind the extra bulk of the case quite as much, but if you're using it for other purposes too, it's not great because it's just always in the way. 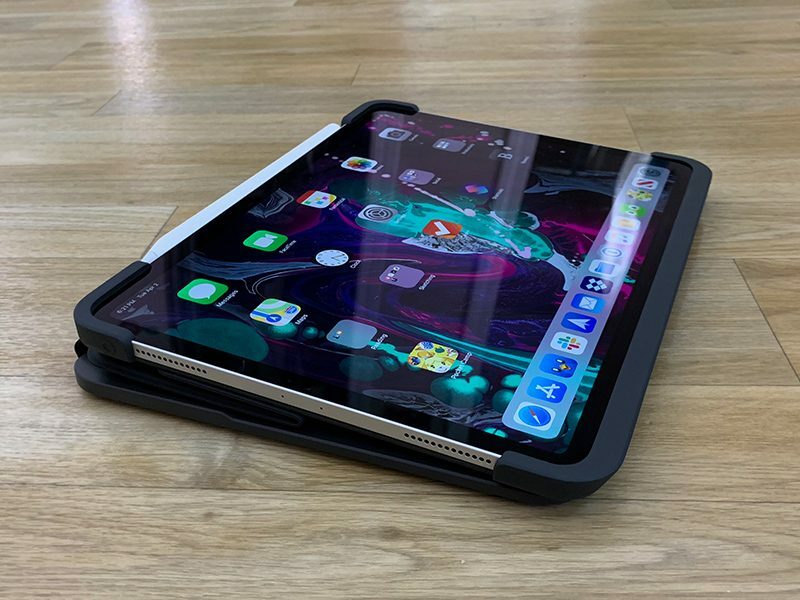 My 11-inch iPad Pro weighs a pound on its own while the Slim Folio Pro weighs 1.27 pounds, and I don't want to hold over two pounds when I'm trying to play a game. For typing, though, I have no complaints. 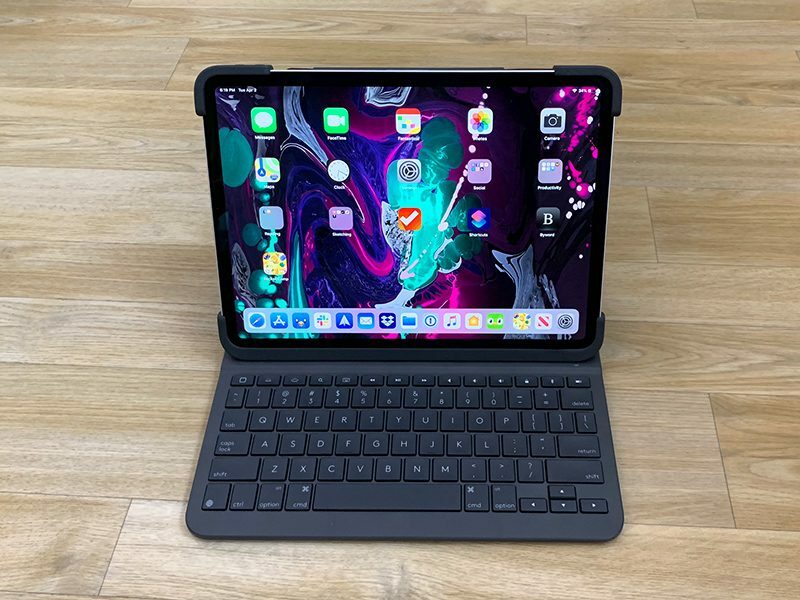 I like Apple's Smart Keyboard Folio and I can type just fine with it, but it's nice having the Slim Pro with much squishier keys that have a good amount of press and more satisfying travel. It's a pleasure to type on, and for most people, it's probably going to be a more enjoyable experience typing on the Slim Folio Pro than the Smart Keyboard. The keys are all backlit, and while this isn't a full-sized keyboard, there's enough spacing between the keys that I was able to type at close to my normal typing speed. All of the keys are in their proper places, and instead of a Fn key, there's an emoji key so you can get to emoji quickly if you want to (or swap keyboards if you use multiple languages). A set of shortcut keys at the top of the keyboard is available for adjusting the brightness of the backlighting on the keys, bringing up the iPad's search interface, activating or deactivating the on-screen keyboard, controlling volume, controlling media playback, locking the iPad and turning off the display, accessing the Home screen, and activating Bluetooth. 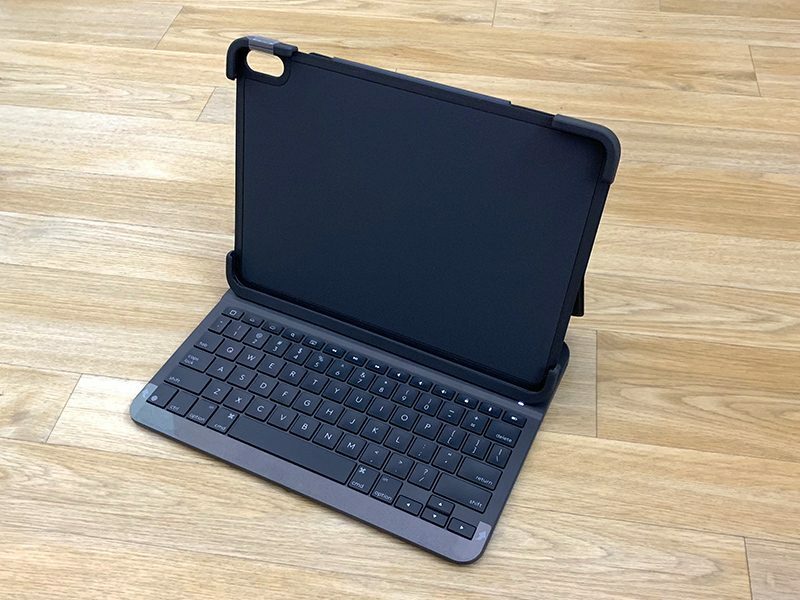 When closed up, the Slim Folio Pro's keyboard rests against the iPad Pro's screen. I don't know if this has the potential to cause any damage over time, but it's also how Apple's model works. With the Slim Folio Pro closed, there's an extra little strap of fabric that's meant to hold the Apple Pencil 2 in place so it can charge while you're on the go, which is handy. The case itself offers a decent amount of protection when closed because of the rubber corners and the keyboard cover for the display, so it's probably going to hold up well to minor drops, bumps, and dings. There are exposed elements though, so it's best to avoid dust and liquids. I didn't have to charge the Slim Folio Pro during my time testing it, and Logitech says that it can last for two to three months used for about two hours a day. If you do need to charge it, there's a USB-C port on the right side, so you can use the same charger that you use for your iPad Pro. The keyboard itself is excellent, but because this is a folio case, it has the major downside of being bulky. It weighs more than the iPad Pro, so it's not going to be for those who like their devices to be thin and lightweight. You can, of course, take this case off when not using the keyboard, but that's a hassle to do on a regular basis if you type a lot. If bulk isn't an issue and you're primarily using your iPad Pro as a laptop alternative for writing and sketching with the Apple Pencil, the Logitech Slim Folio Pro may be for you. 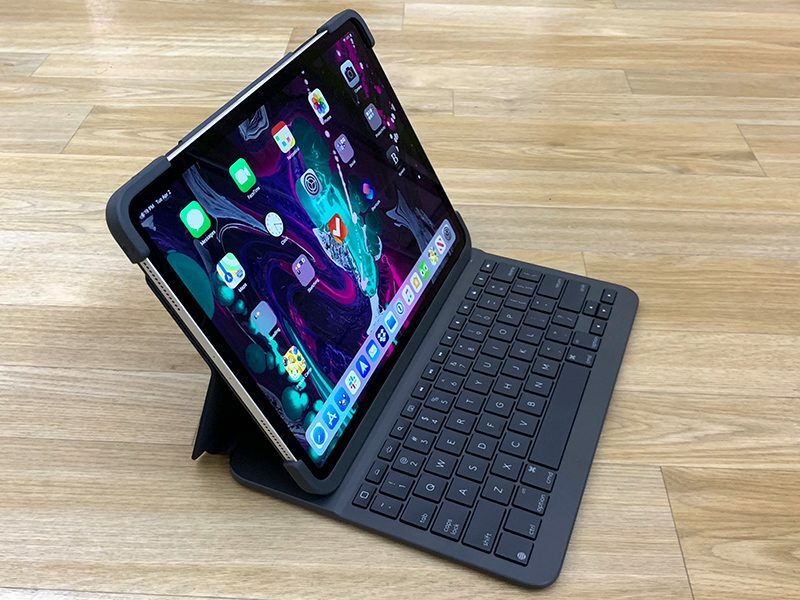 For those who don't want the bulk and hassle of an always-attached keyboard but also don't care for Apple's super expensive Smart Keyboard Folio, an affordable standalone Bluetooth keyboard is potentially the better option. You can order the Slim Folio Pro from the Logitech website. It costs $120 for the 11-inch model and $130 for the 12.9-inch model. Note: Logitech provided MacRumors with a Slim Folio Pro for the purpose of this review. No other compensation was received.